At night I run from zombies. When my daughter is sleeping safely in her bed and my wife is relaxing in our home, I flee from the undead. Someone has to do it in this post-apocalyptic world. We need supplies. Food, weapons, medicine, communications equipment, entertainment. Everything to keep a small township functioning. At night I run from zombies... and it's a thrill. The best part is that you can run from them too. Zombies, Run! is a project I backed on Kickstarter in October. I've been actively playing the game for the last month and I'm in love with it. 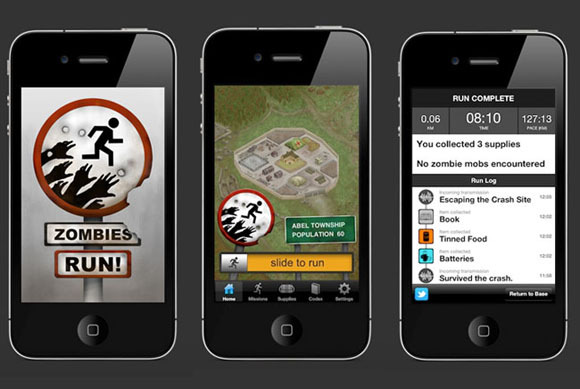 It's a game designed for runners (or walkers) who want to play something while exercising. When I play the game I'm Runner 5 from Abel Township. Our township is fairly secure, but I'm one of the designated "Runners" who run outside the gates to collect supplies, track zombie movements, find out what else is going on in the world, and do general recon. I have a radio operator that tracks my mission and updates me along the way. Once I successfully complete a mission I bring the supplies back to the township and use them to upgrade different buildings. Not only is the game fun and well produced but it's encouraged me to run regularly, something I've never been able to do before. I'm basically going for a run every other night. Before I started playing this game I would run maybe once per week, but now I can't wait to get out there and finish another mission. The story of Abel Township unfolds through the radio operator in contact with me via headset and through other runners and bystanders who are out in the field. Each mission is also mixed with my music from my iphone. Essentially there are story segments intermixed with my own songs while I run. There are around 4-6 story segments per mission and each mission takes around 30 minutes to run. The sound design for the game is fantastic and I've grown fond of the voice actors that I've been with for 30+ missions. All of the regular running app features are present. GPS tracking, pace information, total distance, steps taken, run logs, and more. A whole community is spawning around this game and encouraging the creators to add new features all the time. I'm pretty impressed with the community so far but I suppose there's a lot of appeal. Seriously, who doesn't like the thought of surviving a zombie apocalypse? Currently there is one season worth of content. That's 23 story missions and 7 supply missions. All of the missions are repeatable and the supply missions in particular are designed to be never ending. There's an interval pack of missions added on the way soon followed by season 2 sometime in the near future. Zombies, Run! is currently available for iphone and ipod touch with the android version due out on June 14th. It usually costs $7.99 and it's worth every penny, but if you catch it on sale then you shouldn't hesitate to pick it up. Have you gotten eaten by zombies ever? How do these missions work? Can you fail them? Is it worth buying if I only walk? It's worth it if you only walk too. There's an option when you start a mission whether or not you have zombie chases on. If they're turned off then you just get the story, but no extra zombie chases. If they're turned on then when a zombie chase happens you have to speed up for 1 minute. If you don't speed up for a minute you automatically drop supplies to distract them and you escape anyway. That way there's incentive to speed up, but you never straight up fail a mission. 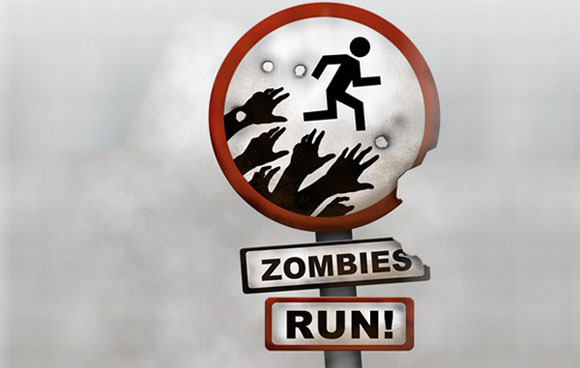 It's all based on whatever speed you're going when the zombie chase starts, so a walker might need to walk faster or do a power walk to escape but a jogger will need to sprint. It's designed for anyone of any speed to play while walking/running.